It looks like as wide-open a staging of jump racing's King George VI Chase as there has been for a bit, one of those occasions when you could go into the pub, tip one of five or six and not look ridiculous. And do not take my word for it, jockey Ruby Walsh, looking for his sixth win after five on the great Kauto Star, has two words to describe jump racing's William Hill-sponsored mid-season championship: "Bloody competitive." Walsh's mount Champagne Fever, trained in Ireland by Willie Mullins, has lack of steeple chasing experience and stamina for the three-mile distance to prove, with the former a more likely stumbling block. He is ranked second favourite behind last year's winner Silviniaco Conti, who, with Al Ferof, attempts to add to champion trainer Paul Nicholls' record haul of eight King George victories, five of them also with Kauto Star. Both horses turn up in apparently very good form, 'Silviniaco', after a November success at Haydock over fellow Kempton big-race challengers Menorah, Dynaste and Cue Card. Al Ferof, last year's third, who prefers the going on the drier side, made a superb return from an absence at Ascot, also in November, and given his conditions can be expected to play a major role. Menorah, a stellar mount for Tom O'Brien in place of the suspended Richard Johnson, has been magnificent this season with a good win at Wetherby followed by that gallant second behind Silviniaco Conti. There is no doubting he will put in another sterling performance, but there are doubts about whether he is likely to be quite good enough. Things have not worked out well so far for Cue Card, runner-up in the 2013 King George, with fourth places at Exeter and then at Haydock. Jockey Daryl Jacob, however, believes the eight-year-old, trained by Colin Tizzard and by his son Joe, the horse's now-retired ex-rider, will put in a better show especially as the Tizzard horses are going very well. My fancy though is for Dynaste, trained by David Pipe with, I imagine, this race very much in mind. The shrewd Pipe team will have been very satisfied with the encouraging nature of the already-mentioned Haydock third place by the grey, last year's fifth, and first or second at both of the last two Cheltenham and Aintree Festivals. 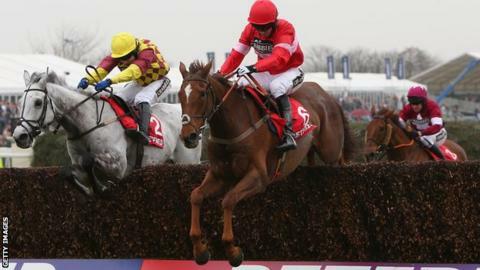 Although also the winner of the 2012 Feltham Novices Chase - now the Kauto Star Chase - in heavy conditions, if the rain stayed away, as forecast, that would not do him any harm. And chatting to Dynaste's jockey Tom Scudamore did not put me off. He said: "He's one of the best chasers in the country. "You think of the likes of Dynaste, Cue Card, Silviniaco Conti, the main English guns as it were, they are all capable of beating each other, and none of their levels of form is much higher than the rest. "As boring as it sounds, it's just a case of who's better on the day. "You've got the Irish horse Champagne Fever as well, and he's very good. He's been doing a lot of his racing over two miles, so the hustle and bustle and speed of the race shouldn't affect him. "He should stay ok, but you can't be 100% sure until he's done it. "My horse ran well at Haydock and is hopefully in good form, and we're looking forward to going there with a chance of coming home with the trophy." My 1-2-3: Dynaste - Al Ferof - Champagne Fever. Can Irish raiders net Kempton brace?